Hello Everyone, I hope you’re all having a good morning. Mine is going well but I’m crazy busy as always! My team at work is quickly growing and within the last four months I’ve gone from having one person in my team to 14 and counting. It’s a really great opportunity and I’m really loving it but I haven’t quite got my head around the fact I’ve gone from being a graduate trainee Business Analyst to a fully fledged Business Analyst to a manager within 3.5 years… it’s crazy! I absolutely love wearing jewellery and the latest edition to my collection is a beautiful handmade piece from a small company named Kimberley Wilson Jewellery. Besides being biased towards the name (hehe) I love to support small companies because not only do I think it is amazing how people follow their dreams and set them up I also love finding unique pieces I know my friends would never have. 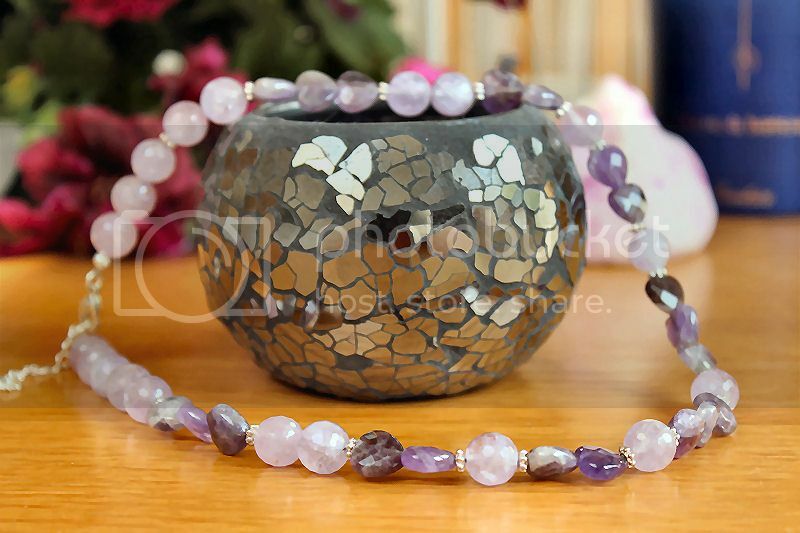 The piece I have is a stunning *Amethyst Gemstone necklace which naturally is a mixture of lilac and purple stones but this necklace has more to it than what first meets the eye. Firstly, the pretty stones are a variety of shapes including delicate hearts and balls which make this necklace even more special and unique. If you look even closer you will notice each of these are cut with a hexagon on the surface which catch the light at different angles… I really love this effect. The stones are also cold due to them being genuine gemstones so when you first wear it they feel really cooling on the skin. The packaging of this necklace was also stunning when it arrived and makes this necklace or other pieces from this company the perfect gift for friends and family. 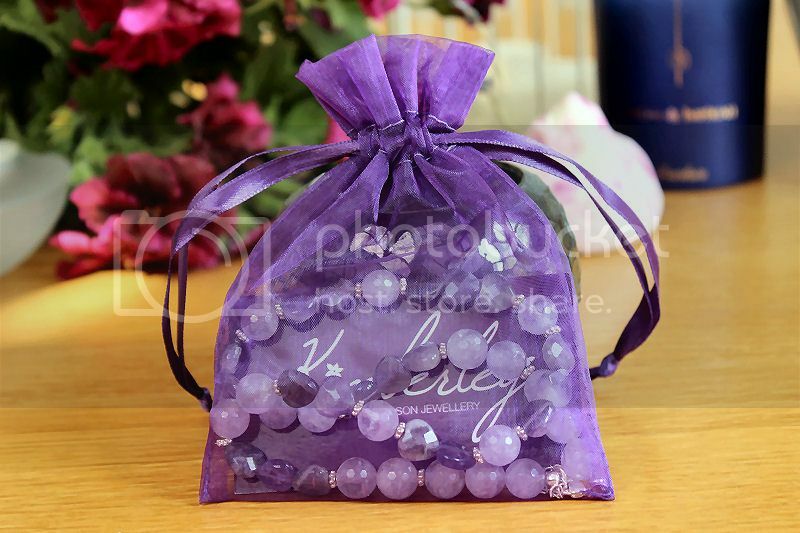 The intense purple bag and matching business card worked particularly well with the Amethyst and it is also a really great way to store your jewellery so it doesn’t get lost or damaged. I have really enjoyed wearing this Amethyst necklace and I have had countless comments from family, friends and colleagues about how pretty it is and where I purchased it. It is a great necklace that can be worn all year around particularly during the Spring and Summer months. If you want to find out more about Kimberley Wilson Jewellery you can check her out on Facebook and Twitter or her website or Etsy Store. I would definitely recommend it. 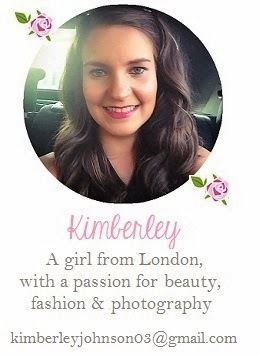 Kimberley is a lovely girl and creates really pretty jewellery. 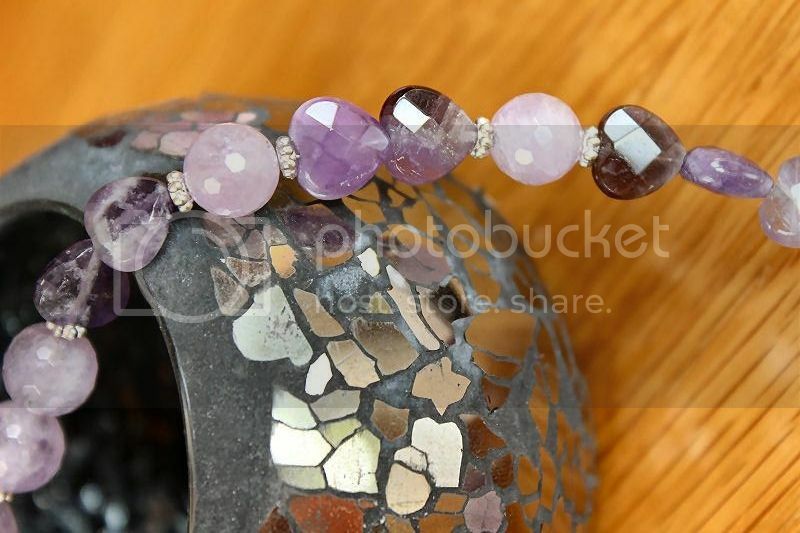 What do you think of this Amethyst necklace? This piece is so pretty! I love the colour and cut of these gemstones!